With options seemingly popping up everywhere, juicing has become on of today’s hottest food trends. However, their may not be a cooler choice than the Juice Dudes. 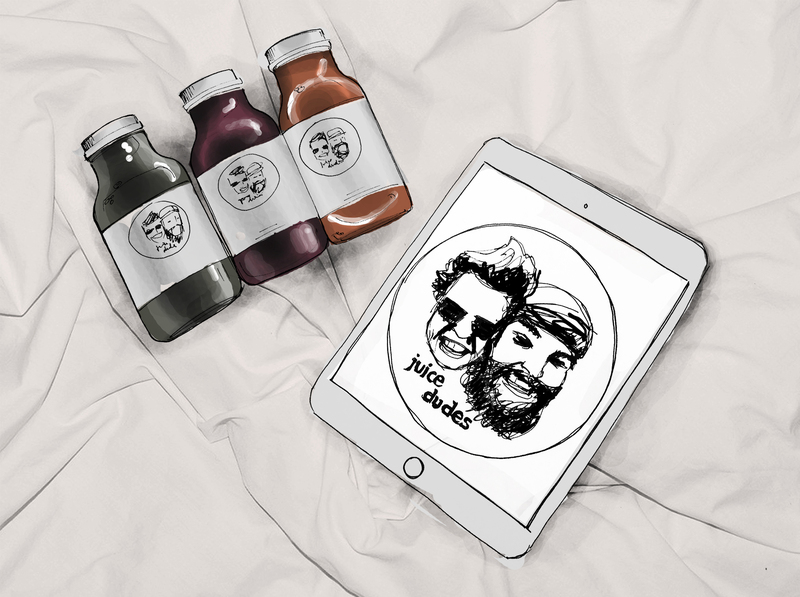 W8H recently had a chat with them and learned more about juicing, what it means to be a dude and where to go out in Berlin. On your website, you mention, that the idea came during an excursion in Thailand. Could you tell a little bit more about it? As passionate thaiboxers the choice of travelling to Thailand seemed plausible and a fun experience before the start of our final year at university. At that time (summer 2013), we’ve been into juicing for quite a while thus we brought along a juicer as company for our journey. Among daily training sessions, hot and rainy weather (unfortunately it was only the end of raining season), and ever increasing physical pain, the daily routine of preparing fresh juices was simply awesome. The idea of turning a hobby into a business came naturally during an afternoon juice with fresh local ingredients. Surrounded by cold pressed juice in the UK we wondered whether the movement had already been adopted back home in Germany. When we figured out that the German market for cold pressed juice still lacked a distinct market leader, we decided to make taking this spot our goal for the years ahead! Green juices are on peak of their popularity these days. It is not something for wellness addicts and vegan and vegetarian fans, but a part of mass culture. What do you think about this trend? Why are juices so popular and what was the starting point? Us dudes seriously love this trend. Although we believe that the peak and mass-market adoption is yet to come here in Germany, we really welcome the movement of healthy eating. From personal experience we know that a nutritious diet helps boost your immune system, makes you think sharper and provides a generally boost to your overall wellbeing. The trend for green juices undoubtedly started in the US when the first famous artists/actors decided to give up proper food and instead started a juice cleanse to detox their body from all the stress and polluted environments they were exposed to. Others even used these cleanses to lose weight. Foolish, if you think about it more logically. Why Dudes? What makes a real dude? Everyone qualifies as a dude! No matter whether girl or boy, woman or man, cat or dog – our definition of a dude is someone that values friendship and manages to also laugh about him-or herself from time to time. Nowadays, its being indoctrinated to conform to what society believes you should be doing. We strive to think differently and aim to express this in our philosophy and approach to business. We are serious in what we do, work thoroughly, set goals and learn form mistakes. The latter we try to minimise to grow quickly and spread a little more of that dudeishness to all you guys! Could you tell us a few words about your workshops? Who are they aimed at? What can one learn there? Our workshops are open to everyone but especially meant to pick up those who need a little kick start. Our last event was in cooperation with the sports and yoga studio Chimosa in Berlin-Mitte. We practised martial arts and rewarded ourselves with fresh juice afterwards. What one can learn during the seminars varies. Most importantly though we want to show you how fun it can be to workout and how great you will feel even after a few weeks into training. Could you tell us a few words about the juice recipes? How do you come up with the ingredient list? How do you test them? What makes a perfect vegetable juice? In our view a perfect vegetable juice balances fruit and veggie components in a way that sugar levels are minimised while freshness and sweetness are retained. We want to create something tasty that does not only convince you with its health benefits but most importantly through its taste! Buzzwords: superfoods, detoxing, cleansing and so on. What is your opinion? Can one fix him or herself by only drinking juices for a week in a row? Good marketing, we don’t believe in it and slowly but surely an ever-increasing amount of scientific studies confirms our view. If you want to detox and don’t trust your liver to do the job sufficiently, eat a cucumber. It should do the same job as fancy juice cleanses but is a lot cheaper. In short, Juice Dudes don’t believe in fixing anything by solely drinking juice for a week! Foods of the year 2014 were: sauerkraut, kale, coconut oil, Acai and goji berries and chia seeds. What is your forecast – which foods will star in 2015? Sauerkraut? A weeeej that’s a surprise… We love dates in our morning smoothies and usually add Maca powder and chlorella to mention some of the trendy superfoods 😉 We believe that also 2015 is going to be their year and count on i.e. wheatgrass or aronia berries for future juices. For Juice Dudes, what makes a healthy lifestyle? We see a healthy lifestyle as one that is shaped by regular workouts and a balanced and nutritious diet. Of course you don’t need to be too hard on yourself. We love that occasional afternoon beer just as much as you do 😉 Especially now that spring starts and everyone start sharing love again. Our tip: Try to see it as a reward for a successful week, fulfilment of a certain goal or something similar rather than as a daily after-work routine. Trust us, it’ll even taste better! What do Dudes cook for themselves? What are your favorite recipes? Well, that varies. Yesterday’s dinner was beetroot, tofu and feta. All fried in a pan and feta added in the end. Tasty and simple; we like to keep it vegetarian but still don’t resist that occasional steak. Where do Dudes go out? Some places in Berlin you’d recommend to try out? We don’t have a favourite bar or club. It rather depends on the event, people we are with and vibes we feel like. What’s important to us is an open environment, a crowd that spreads love and a DJ that knows how to heat up the audience. Try Sysiphos in summer, that place has all the above characteristics. Fruit or vegetables? – Veggies all the way! Steak or salad? – Steak, steak, steeeeak! Home cooking or eating out? – Lately it’s been a lot of home cooking… Mixed feelings! One last healthy tip: Stay Juicy! To learn more about Juice Dudes, check out their website and follow them on Instagram.